Don’t get us wrong. Everyone seems more than satisfied with 2011’s offerings. So without further ado, let us show your our list. We’re including a little bar chart this year that shows both our weighted, absolute score, and the “popularity” that considers how well a movie fared among all our critics. It may be silent, but The Artist earns some very loud applause. Hugo is a dreamy triumph for Scorsese. Iranian movies have matured; A Separation is one of the most emotionally complex movies of the year. Is this a Pygmalion story? Perhaps Frankenstein? Director Pedro Almodóvar returns to his horror roots. War Horse stumbles out of the gate but finishes strong. George Clooney holds his tribe together in Alexander Payne’s family drama. 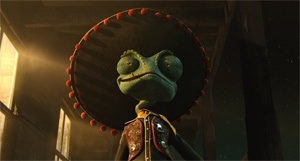 Sergio Leone meets Chuck Jones in Gore Verbinski’s animated western. Ron Fricke returns after a decade, and Samsara is even better than Baraka. There are 19 other nominees for Top Ten from the lists of 4 Movie Habit writers. See more at the page with our Top Ten 2011 Data.